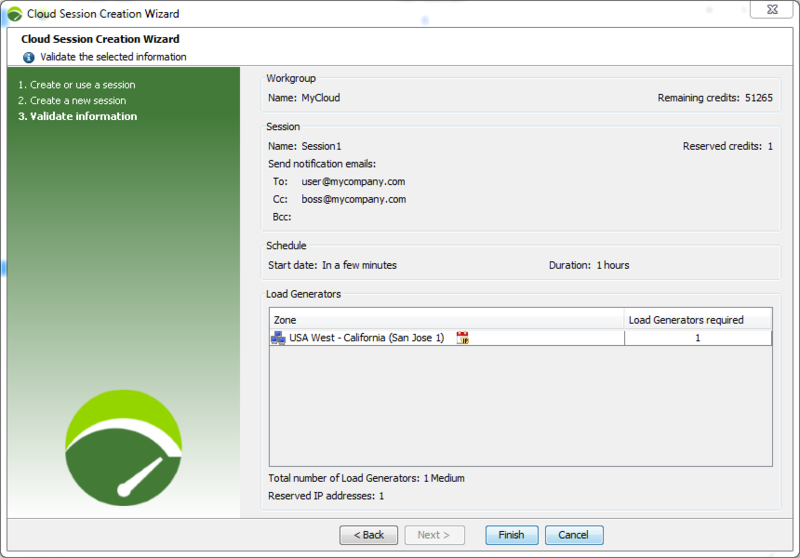 Creating an on-demand Cloud session allows directly adding Cloud Load Generators to a NeoLoad project. Neotys can provide Cloud Load Generators in several geographical zones. Renting Cloud Load Generators requires Cloud credits, as described in Cloud credits or VUHs, as described in VUH. Tip for Cloud Credits only: Before starting a test, it is advised to launch a sizing test and define the number and size (Medium or Large) of the Cloud Load Generators in every geographical zone required. For more information, see Cloud credits only: Size Cloud Load Generators. Tip: To ensure Cloud resources are available, it is recommended to reserve a Cloud session. For more information, see Reserve a Cloud session and Use an existing or reserved Cloud session. The Cloud Console is displayed. In the Session group box, it is necessary to click the cloud icon to Add a Cloud session. The connection window is displayed to enter the account login details, as described in Connect to the Neotys Cloud Platform. 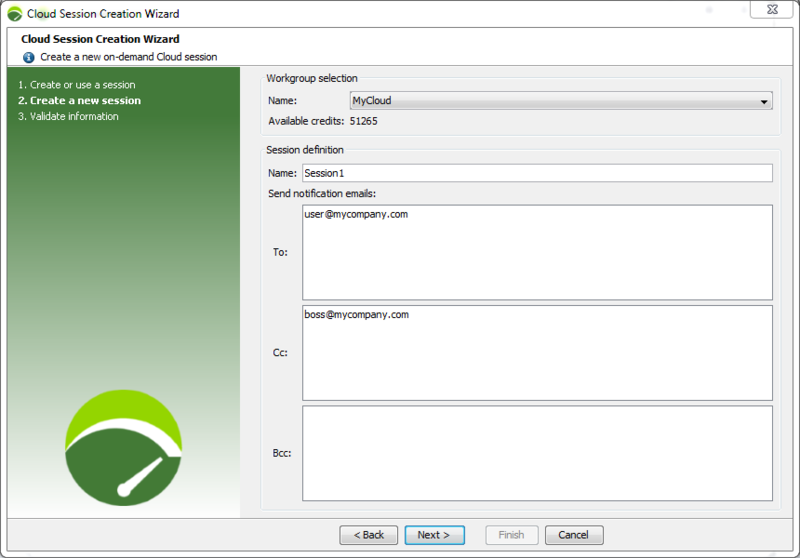 Once the Neotys Cloud Platform is accessed, the Cloud Session Creation Wizard is displayed. The Create a new on-demand Cloud session option must be selected before clicking on the Next button. The first Create a new session panel is displayed. In the Workgroup selection group box, the Name drop-down list makes it possible to select the workgroup charged for the Cloud session. The Available credits or Available VUHs line displays your payment balance for the selected workgroup. at least one email in the To notification field. Notification emails are sent when the session is started (the email contains the Load Generator IP addresses), 30 minutes before the session ends, and before and after the Cloud session effectively ends. Other To, Cc, and Bcc emails can be entered. A click on the Next button displays the second Create a new session panel. The Schedule group box makes it possible to select the duration of the session. 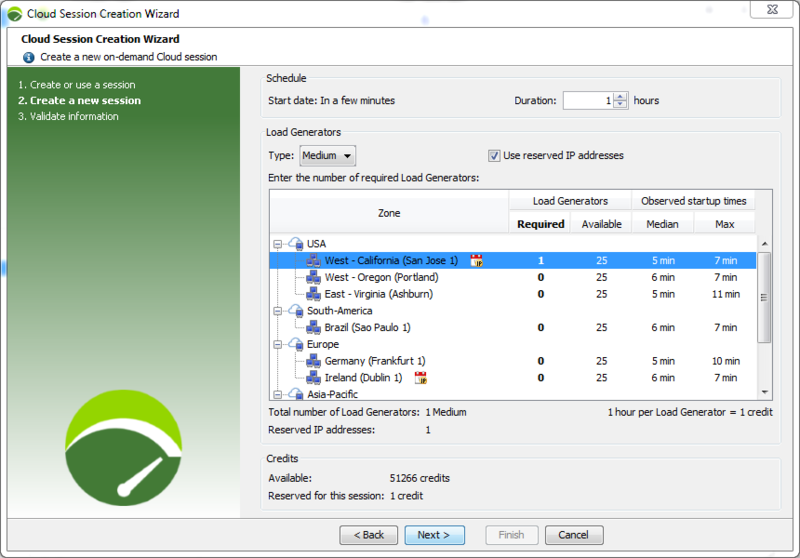 The Start date shows "In a few minutes", meaning that the on-demand Cloud session starts as soon as the wizard is closed and the Cloud Load Generators are available. In Duration, the duration of the session in hours must be entered or selected. Information: The startup time of the Cloud Load Generators is provisioned by Neotys to have the full control over the specified duration of the test and its cost. The Load Generators group box is different according to your payment mode. These characteristics, and the available bandwidth values alike, may differ with the zone used. If you are paying with Cloud credits: In the Load Generators column, the Required field makes it possible to enter a number of Cloud Load Generators. The maximum number of Cloud Load Generators available is displayed in the Available column. By default, in most zones, a maximum number of 25 Cloud Load Generators can be started. For more Load Generators on a zone, contact a Neotys Account Manager. A click on the Next button displays the Validate information wizard screen. After checking the information for the session, a click on the Finish button starts the session. Once the session is created, the Cloud Console is displayed. 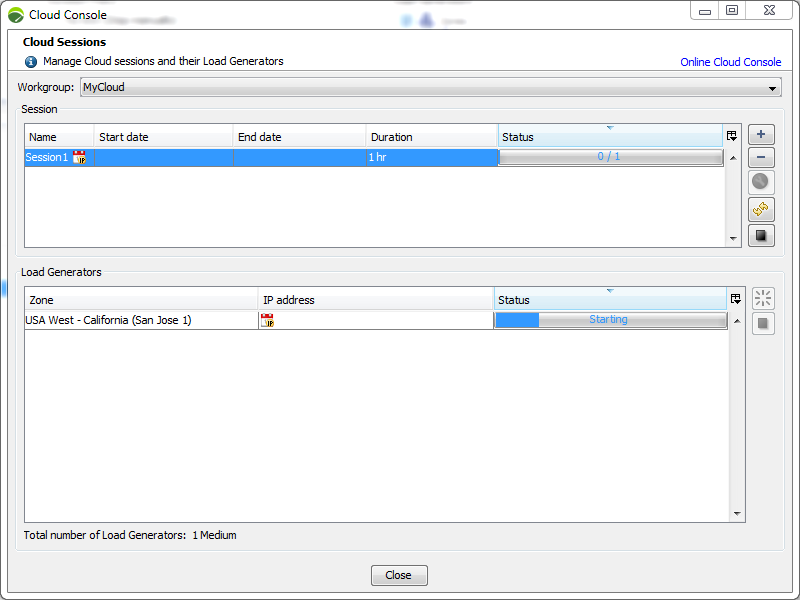 The console shows the starting process of the selected Cloud Load Generators. When the Cloud Load Generators are ready, the test can be started. In the NeoLoad Controller toolbar, choose Open Cloud Console. In the connection window, enter your login details. In the Cloud Console, click + (plus). In the wizard, choose Create a new cloud session on-demand. Click Next. In Name, enter the name of your session. In To, enter a notification email. You can enter other To, Cc and Bcc emails. Enter the Duration of your session. Cloud credits only: In the Type drop-down list, choose Medium or Large Load Generators for your session. If you have reserved IP addresses, the Use reserved IP addresses option is selected by default, unselect it if you want to use different IP addresses for this Cloud session. Enter the number of Cloud Load Generators (if you are using Cloud credits) or the number of Virtual Users (if you are using VUHs). In the last wizard step, check the session information. Click Finish. Once the session is available, start your test.